I have been constantly thinking of the blockbuster movie Om Shanti Om as the televised drama of Sridevi’s life, including lurid details of her family and interpersonal stories, and her death unfolded one after the other, all in public view, since 25th February (late in the night). Just as the fan-protagonist (played by Shahrukh Khan) of Om Shanti Om, who was drawn to be unwittingly a victim of the events and a helpless witness to the life and death of a dream-girl actress ‘Shantipriya’ (she too wore costumes like that of Hema Malini and Sridevi in movies like Dream-girl and Himmatwala), the entire world looked-on with gaping disbelief as frame after frame peeled open in public view. The ‘nation’, as it were, was held in a breathless ransom during those seventy two hours post Sridevi’s death (echoes the name ‘Shantipriya’). 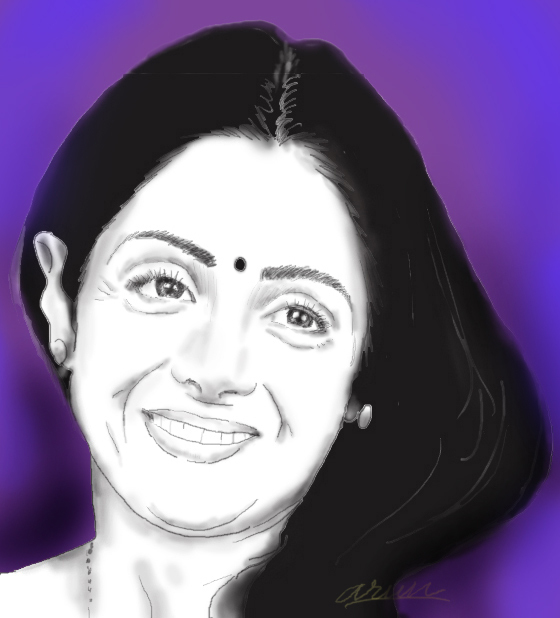 Sridevi achieved in her death, what she had achieved in her life – keeping the audience glued to their television/ smartphone screens, through her mesmerizing flash-bulb eyes staring through shot after shot of her death videos, news bytes, and ads. The wait seemed to be an eternal, what happens next in the narrative. A colleague of mine confided in a personal conversation, “I cannot believe how much all this is affecting me”. It was at that point I realized that all this was affecting me, no less. We were the pin-up generation of 90s. In our dorms/hostel rooms posters with large, smiling faces of Sridevi, Madhuri Dixit, Madhubala stared squarely into our eyes, spreading their halo from over our study tables. These days there are many young friends, who tell us, that no one pins up celebrity posters. I usually respond to that statement, thinking, well, it is good for them – at the least, they have escaped the aura, as Walter Benjamin so painstakingly defines in his “Work of Art in the Age of Mechanical Reproduction”, of celluloid personalities. Celebrity deaths are not uncommon. Elvis Presley, Marilyn Monroe, Michael Jackson, Kurt Cobain, Heath Ledger, Robin Williams, to name just a few have died under strange circumstances. In India, such deaths are not common; they are not uncommon either in celebrity histories. It is the need for critical understanding on the impact of the narratives surrounding celebrity deaths on public/individual memories, specifically in the South Asian context, that demands scrutiny. In an April 2016 article entitled, “Celebrity deaths will become more frequent. How should the media report them?” ,Tim Johns, a BBC 2 Broadcast journalist (in his webpage timjohns.org) claims that, “The only news that ever gets reported will be about death. We’ve had a taste of that this year – and it ain’t right.” It does seem that at times the glamour associated with sudden deaths of celebrities is going to perhaps find a larger space in the thought process of media channels of the future, and thereby in the public imagination. The European and American film industries seem to be bracing up to handle psychological impact of these deaths, the Asian context is rather less prepared. It does seem that at times the glamour associated with sudden deaths of celebrities is going to perhaps find a larger space in the thought process of media channels of the future, and thereby in the public imagination. In a way, death has its own romance and provides a sense of catharsis to human imagination. Reports on Sridevi’s death prove the norm. If you observed the narrative surrounding this death, it is almost like a potboiler cinema. The story of forensic reports, misspelt words on the reports, the bathtub saga, the constructed pictures on YouTube inside the washroom; all this adds up to one quintessential thought – feeding of random information into public imagination. The World Health Organization (WHO) has a clearly specified frame of guidelines as a “Resource Book” for Media Professionals for Preventing Suicides (2008), which has textbook kind of pointers on “Responsible Reporting” that include sections like: “Word Headlines Carefully”, “Exercise caution in using photographs or video footage”, and “show due considerations for people bereaved by suicide [or death]”. However, textbooks are just templates, how many of us actually follow them in our everyday lives? To give due credit to the practices of journalism, this idea of responsible reporting is actually difficult to follow when the high of getting to the truth is driving our thoughts more than anything else. Now, as far as the subjective nature of truth and truth for TRP is considered, that is worth more detailed research. Rough translation: “Do not know why am I having an uneasy fear”. For a moment I chose to ignore the post, thinking it is just his musing. However, a few minutes later my interest was piqued and I started thinking through it. In a couple of hours, there were several messages that spoke of premonitions, superstitions, etc. and connected this post to Sridevi’s death. The real saga began in the morning when people kept bringing the premonition on Twitter into public and critical discourse. The entire connection of two distinct episodes – one an online Facebook post, and the other a real-time tragedy (wish it was just an online story rather than a real tragedy), seemed to in one go blur the boundaries of the virtual/ digital and the real. Added to this, a concoction of the eerie, the superstitious, with the real and the probable, was the excruciating wait for the body to arrive back to the country. Watching Sridevi’s homecoming on 27th February evening was poignant. It was as though we breathed a sigh of relief to see the flight land. To be honest, an individual would have no other option than either to watch the saga unfolding on television or just switch off the television set. There was no escape. It was on print, on television, on digital popups, on smartphone screens, just everywhere. YouTube was not giving respite either, full of dramatic grotesque visuals, and so was the case with strange forwarded messages on WhatsApp. Pages after pages on online news channels hand-held us through the tragedy repeatedly. The public voyeurism associated with celebrity life is such that it is difficult to dissociate and switch off the television screen, when the media frenzy is so high that it almost feels as if things are happening in your own courtyard. The reporting of the event and the entire drama post her death by the accidental drowning (apparently spelt as ‘drawning’ in the reports) in a Dubai hotel, left the world speculating on the celebrity-ness of life. It was a relief (at least for me), on 27th February evening, as I watched the ambulance to know that she was at least back to her own children. I felt as if someone I have known for long has returned back home, to the safety of her own world. Watching the media coverage of Sridevi made some of these minute details of human life, seem so macro-cosmic. I had not thought until these strange details kept popping-up from nowhere, that not talking to people for 48 hours, can be life-threatening. It is such a common phenomenon of urban existence that we really do not take note of these minute details, until something larger than life happens with us. For several days, many among us do not talk to or meet people. It is not uncommon in the extremely hectic schedule these days. Such details and other medical histories in celebrity deaths start making people feel that if this could happen to them,then we are just lesser mortals in the game of life. Watching the media coverage of Sridevi made some of these minute details of human life, seem so macro-cosmic. The moviegoers in India can be really vain. I say vain with deliberate emphasis, because we still have not emerged from the colonial psyche of considering cinema as just entertainment and not as art. The public who buy a film ticket weighs a hero/heroine by the price that he/she has paid for the ticket. Therefore, many actors (actresses, specifically) are either a part of the secret fantasies of the movie-goers, or are people they worship as screen gods/goddesses, or are easy beings whose personal life is open to speculations and imaginations and unkind language/slang. We (I am a part of that moviegoer world) really do not understand that the craft we see on screen is a result of years of hard-work, physical and mental exhaustion, and possibly emotional vacuum of the celebrity. We fail to realize that celebrities are human beings. They too have choices – of being social, being private, being friendly, or being loners. It may be just a character trait – not an abnormality or a personality aberration. We (the world beyond art and cinema) are like them – human. It is just that their life under arch-lights create the enigma of personalities, making them larger than life, where a certain distance through glamour and make-believe happens between us and them. It is only when they succumb to the human, such as, disease, death, mental agony, or corruption, that we the consumers of art suddenly take note of the fact that they are like us. The human aspect of media at once comes to the fore, when that brand-cluster called media, like us poor mortals, starts desperately to put bits and pieces into place, and constructs another persona, a different celebrity, distinct from the celebrity that we knew through their performance and art. This strange, unfortunate, lonely persona lives in our memories forever. We (I am a part of that moviegoer world) really do not understand that the craft we see on screen is a result of years of hard-work, physical and mental exhaustion, and possibly emotional vacuum of the celebrity. I usually suggest to my friends seriously to monitor the amount of news of celebrity deaths/ suicides/ physical and emotional breakdowns, etc. that their children are being exposed/ subjected to. In an article entitled, “Do newspaper reports of suicides comply with standard suicide reporting guidelines? A study from Bangalore, India” in Volume 60, Issue 7 of the International Journal of Social Psychiatry (SAGE publications), Prabha Chandra, et al. raise concern about the impact of media reporting on suicides in South Asia (p.687-694). They believe that media guidelines of reporting deaths (specifically suicides in South Asia) are not adequately followed or seriously considered. Similarly, the Mind Frame: National Media Initiative page also cautions about the ways in which reporting of celebrity deaths/ suicides deserve to be followed by standards of media reporting. These tiny bits of information do leave a long-term impression on minds of people. As a child, I was fond of Divya Bharti and watching the news of her death on national television had left a deep impression on my child-mind. After, the Divya Bharti death episode was broadcast on national television, I grew to dislike the actresses that took away Divya Bharti’s movies after her untimely death (one such actress was Sridevi because she took away ‘Laadla’). For several years, in school we thought of Divya Bharti, her exceptional beauty, and discussed/speculated about her sudden death. Those among us, who had a sensitive mind, would perhaps reflect on the entire event with sharper instincts and thoughts for much later than school days. The impression of suspicion, fear can be planted easily if one studies the language, the approach of those reports. If it was an actress, the speculations are far harsher and unforgiving – beginning with interpersonal relationships, to marriage, to character, to body and body-shaming, as open spaces of unabashed speculation. After the funeral of Sridevi, it seemed like there was an organic closure for media and media frenzy. Finally, the silence is now deafening after the curtain was drawn on this real life blockbuster. Among all the comments and tributes that I have come to see/hear over the last few days, the one that strikes a chord for me the most is that, “she was a child trapped in a woman’s body” – true, for so many women like her, who are struggling to make sense of the world of perception, practicality, and emotions. Arnapurna loves tinkering around with forms of writing and is in quest for new genres of creativity. An alumnus of the batch of 2010 IIT Bombay (Department of Humanities and Social Sciences), she researched on the theories of Mikhail Bakhtin and the fiction of Amitav Ghosh for her doctoral degree. 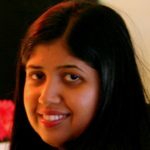 She is currently working as Assistant Professor in Humanities at IIT Gandhinagar. She has a passion to explore intersections between literature and philosophy, between theory and practice, and between life and creativity. Arnapurna believes that a little compassion and some poetry in life can make the world a better place to live.